Contemporary Art from Saudi Arabia, a pioneering exhibition at the Brunei Gallery of the University of London. Edge of Arabia, which opened on October 16th at the Brunei Gallery, School of Oriental and Africa Studies (SOAS) of the University of London, offers a unique opportunity to see the work of 17 contemporary artists from Saudi Arabia. The featured artists are part of a new creative movement within Saudi Arabia. In their works, they respond to a wide range of themes, including their personal relationship with the Islamic faith, the artist’s voice in the media age, and deal with the history, culture and ecology of the region. Within the circuits and flows of a globalised, media saturated world, Saudis are often portrayed as a homogenous and generic stereotype. Edge of Arabia aims to challenge this view. The exhibition is the culmination of a creative journey that started five years ago. 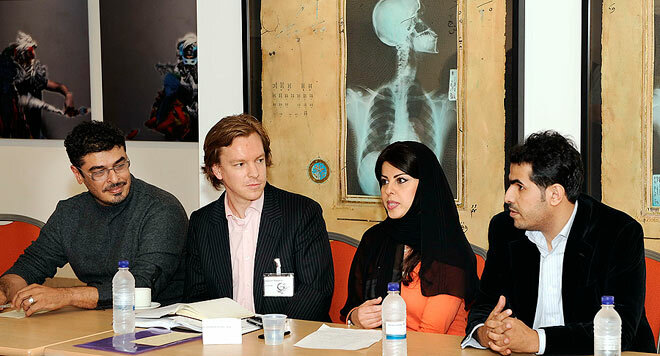 It is based on longstanding friendships between a small group of British and Saudi artists. Both the exhibition and the accompanying educational program was organized by Offscreen, which promotes cultural understanding between the Middle East and the United Kingdom.